So, of course, we had a little party, wore goofy little hats, had some homemade cookies and sang Happy Birthday. 1. Preheat oven to 350 degrees F. Prick sweet potato several times with a fork. 2. Heat sweet potato in a microwave on high until tender, about 6 minutes. Cut potato in half and scoop flesh out of the skin into a bowl; discard skin. Mash potato with a fork or potato masher and transfer about 1 cup to a large bowl. Save any remaining sweet potato for another use. 3. Mix whole wheat flour, applesauce, and eggs in the large bowl with the sweet potato until a dough forms. Turn dough out on a well-floured surface and roll dough to about 1/2-inch thick. Cut out shapes using a cookie cutter or cut dough into strips with a pizza cutter. Arrange cookies on an ungreased baking sheet. 4. Bake until crisp, 35 to 45 minutes. Cool in the pans for 10 minutes before removing to cool completely on a wire rack. 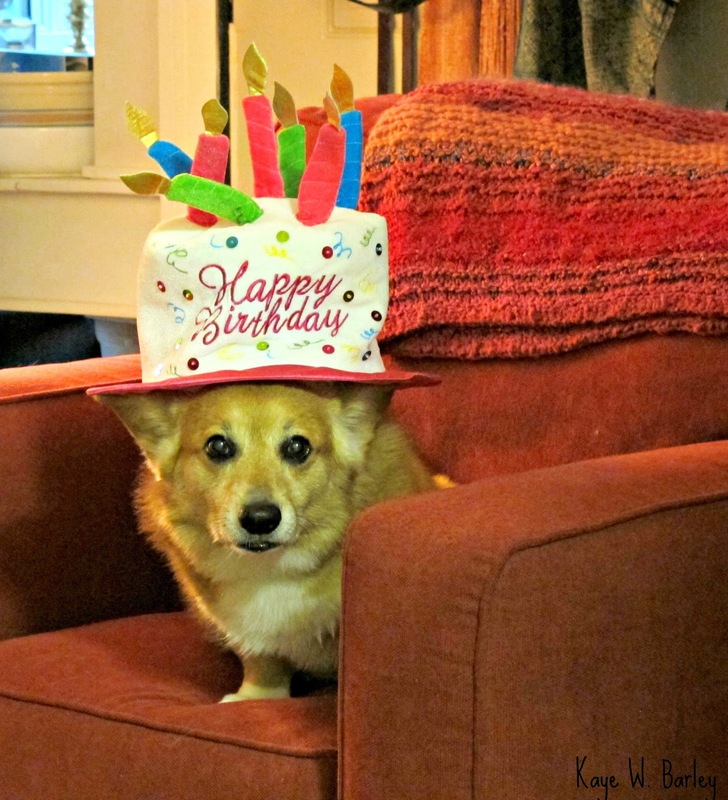 So, tell me Reds, how do you celebrate furbaby birthdays at your house? Happy birthday Harley! Your mom is very sweet to make those delicious cookies:). In our house we sing HBTY and we shake our heads in amazement that time has gone by so quickly!! Our standard poodle received a banana inside a hotdog bun, his two favorite foods combined. Lucy - it does seem to scoot by quickly, doesn't it?! Margaret - I love this. What a fun idea this is! Harley loves bananas too, I think he'd enjoy it in a hotdog bun. No idea what day mine were born, all rescues, the vets and I have a hard time figuring out a year for the records, no way to guess anything more specific. They tend to use the day I brought them in as a birth day and month. Hallie, Harley has declared you an official auntie, so we will keep you mind for all future celebrations. Susan, there you go! As it should be! Aubrey, I guess I'd never really considered how this would go for rescues. So, "rescue day" works perfectly! Yes, we have reuses..... But We always mark the day they came home to us — Lola's rescue day is Mother's Day and Xander's is July 1. Hahahahaha - here, let me pour you a cup, Susan! (and oh yes, we do understand how that lack of coffee thing affects the typing - not to worry). Ah, that handsome Harley. With all the cats, birthdays tend to be overlooked. But, there was always a new toy for the first birthday. I know just when Dickens was born because he was born behind the bookcase, but it's just a guess for the others, Sending hugs to that wonderful Harley! How appropriate for Dickens to be born behind the bookcase! I love that! and Harley and I send hugs back, Lesa. Happy Birthday Harley, you lucky dog! Yes, my cat Mrs. Purdy (NO idea!) had her kittens in my closet on my first day of high school in 1963. Talk about a bid for attention! But we always remembered when the kittens (F.Scott, Zelda and Picnic--NO idea! ) were born! Happy Birthday, Harley Doodle Barley! Message to Kaye!!!!!!!! First, huge hugs to one of the dearest dogs on the planet!!!!! Dax was born on September 11th. We've always thought that made her extra-special. She'll be three this September--I can't believe it! We can guess when Jasmine was born within about a month, but Rick and I can't agree on a day to celebrate. I say January 12th, my dad's birthday, or Jan. 31st, his mom's birthday. He says February 14th. (Just for the record, my dates are probably more accurate:-)) So she will be two SOMETIME this coming winter! The dogs always get special treats or stuffed toys. Thelma - email villains - aargh!!!!!! Get in touch when they've released you as a hostage. Debs, I just "knew" furbaby celebrations happened at your house; just knew it (and love it). Please tell Dax and Jasmine that Harley appreciates the birthday wishes. Happy Birthday, Harley! You look quite smashing in your birthday hat. I love that your mommy spoils you with homemade doggie treats. So nice. Our doggie Abbie, who passed away this spring, was an estimated birthday, too, as we got her through the shelter. Vet said three months old, and she joined the family in February, so for the next 15 years, we celebrated her birthday at Thanksgiving with extra treats and some yummy Thanksgiving turkey. Thanks much, Kathy. Abbie lived and long and happy life - as it should be. Happy birthday, Harley! Your cookies look excellent. And they sound people good too. Have an extra as a celebration reward from me.